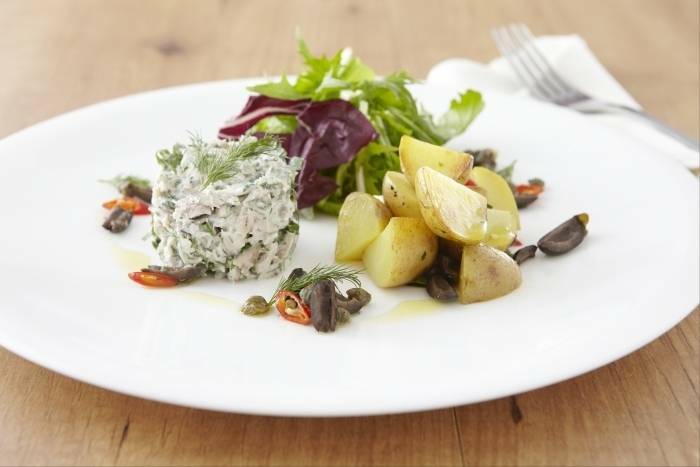 Smoked mackerel rilettes served with a spiced olive and caper potato salad. Melt the butter gently in a saucepan. Pour off the clarified butter leaving the milk solids behind. Chop the parsley and dill. Remove the skin and the bones from the mackerel and flake into small pieces. Mix the fish with the herbs, butter, creme fraiche, a squeeze of lemon juice and cayenne. Use a spatula to make sure the ingredients are well mixed. Check the seasoning and add a pinch of salt if necessary. Boil the new potatoes in salted water until tender. Drain, allow to cool and then cut in half. Dice the chilli and black olives. Heat a frying pan until hot and add a splash of olive oil and fry the potatoes until golden colour. Remove from the heat and mix the diced chillies, olives and capers through the potatoes. Season with salt and pepper. Wash and dry the salad leaves and dress with a drizzle of olive oil, salt and pepper. Place the potatoes in the centre of the plate using a stainless steel ring, arrange the salad around the potatoes and finish with a quenelle of the mackerel rilettes.